Cook and drain fettuccine as directed on package. In 10-inch skillet, cook bacon and garlic until crisp. Drain; remove from skillet, and set aside. In small bowl, slightly beat egg. Beat in milk, Parmesan cheese and pepper. 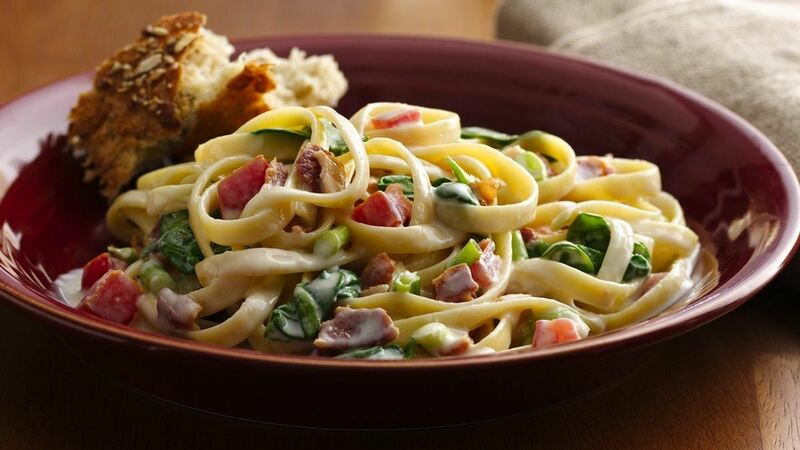 Place cooked fettuccine in skillet. Add milk mixture, spinach, tomato and green onions. Cover; cook about 5 minutes over medium-high heat, stirring occasionally, until spinach is tender. Stir in yogurt; cook over low heat just until heated through. Make It Your Way: Serve with additional freshly grated Parmesan cheese and freshly ground black pepper. Serving Suggestion: A Caesar salad, crusty French bread or a baguette, and gelato or ice cream for dessert would make this Italian menu complete.